At this time of year, our phone starts ringing off the hook looking for our CEO, Terry Belt, asking for his forecast of what this year in real estate will hold. And while his crystal ball may be as imperfect as everyone else’s, he has weathered 27 years in the Northern VA real estate market and done it uber successfully. This brings with it a good look in the rear view window, but at the same time an ability to spot & react to trends quickly. Last year Northern Virginia experienced a market where housing inventory was low year round. Inventory rose slightly during the Spring, but pent up demand meant that many of the homes were snapped up as they hit the market. I expect that to continue in 2014. Although we experienced a market where buyers were competing for homes back in the 90’s and again at the height of the market in 2006, this market is different in that the number of homes selling is much less. Homes sold quickly in those earlier markets, but new homes came on the market to replace them. Currently, we still have demand left over from the downturn, as well as new purchasers entering the market, and there are large numbers of buyers just sitting and waiting for homes to come on the market. Many of these buyers have been looking for months & months. The number of homes coming on the market just cannot keep up with the demand. The question will be whether that will continue to drive up prices or whether rising interest rates will price some of these buyers out of the market. Keep in mind that a 1% rise in interest rates equals a 10% decrease in home price affordability. Stay tuned to see how that plays out. In the immediate short term, look for early Spring market conditions to be very similar to 2013. 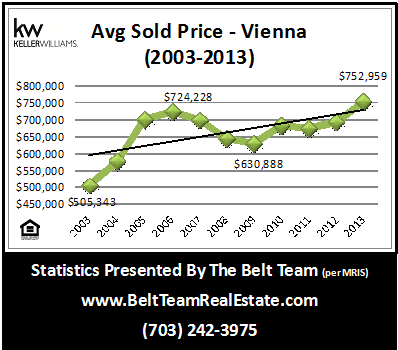 Home prices in Northern VA continued to rise last year and I believe this trend will continue in 2014. From 2011 to 2012, the median price rose 4.82%. And from 2012 to 2013, the median price rose 7.13%. This is good news for homeowners who were underwater. 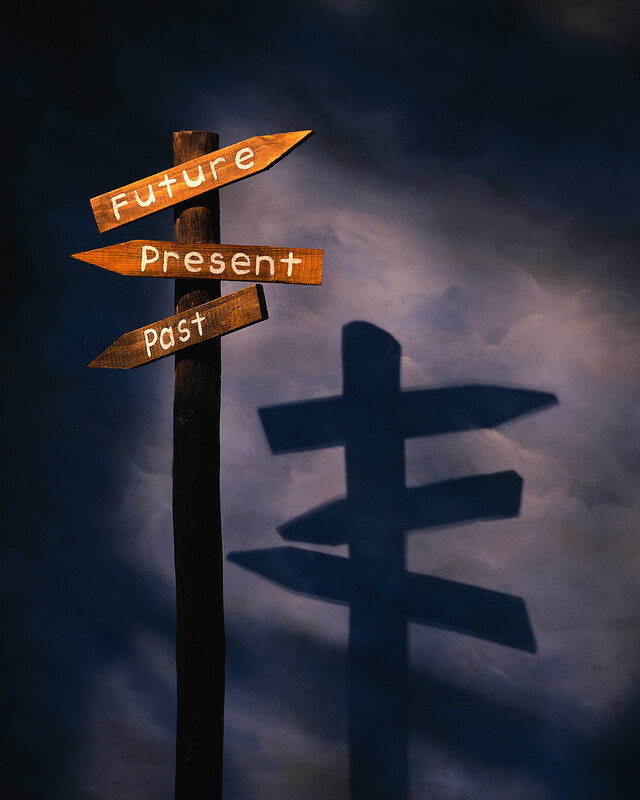 If you tried to sell unsuccessfully during the years 2008-2011, your golden ticket may just be cashed this year. For several years, we have had interest rates at historical lows. This will not last. In fact, we have already seen rates rising. While this may price some buyers out of the market, it actually may work in reverse for other buyers. The silver lining to rising interest rates is that means less refinancing business for lenders; and that may result in lenders loosening their standards in order to compete. Just this week, we were notified by several of our lenders of new programs they are offering that are more flexible than what we have seen over the past few years. The market will continue to do well if the local economy and jobs remain positive. Should this change it would have a slowing effect on housing. If you’re thinking about buying or selling a home in 2014, the absolute most important thing you can do is to make sure you have the best Realtor representing & advocating for you. There’s a lot to navigate along the way – appraisals, surveys, legal disclosures, when to sell, how to price, how to stage, what to disclose, what not to disclose, mortgage financing, how to compete and more. Every market has its own ins & outs & idiosyncrasies. Do You Want To Do The DANCE FOR JOY?! Whether you live in Vienna, Oakton, McLean, Fairfax, Falls Church, Reston or any of the other awesome areas of Northern VA – if you’re thinking of selling your home in 2014, this is a MUST WATCH 30 second video! Our marketing at The Belt Team may be a bit outside the box, creative, tongue-in-cheek – but we are SERIOUS about our commitment to our clients. We have SO many Buyers who need homes. Help us help them! 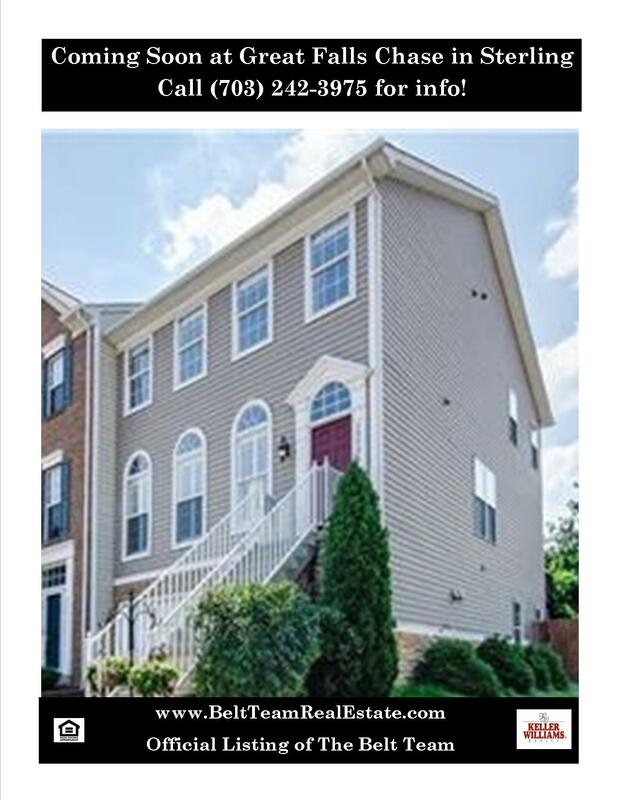 Call (703) 242-3975 if YOU are thinking of selling. And if you’re not in the market to sell – please share this video! DO THE DANCE FOR JOY! Meet Our Buyers – Maybe YOUR Home Is A Match?! Terry Belt, CEO of The Belt Team, and nationally known Realtor, recently guested on Real Estate Radio Washington where he was asked about the state of the Northern Virginia real estate market. The discussion centered on whether you should buy or sell now, what’s happening with mortgage interest rates and more. Our mission at The Belt Team is “Changing Lives For The Better“. If it’s time to change YOURS, call (703) 242-3975. We’ll help you make the RIGHT move! If you’re buying a home in Northern Virginia, you may have heard talk of new mortgage guidelines & regulations, but aren’t sure what that means for you. So we asked our Partner Paul Diaz, Senior Loan Officer with New Penn Financial, to explain. What Is A “Qualified Mortgage”? Lenders that follow underwriting guidelines and product guidelines exactly when they write a loan will be considered to be making a ‘qualified mortgage”. “Qualified mortgages” will provide lenders and borrowers certain legal protections in the event the borrower should default. Lenders will more than likely still write mortgage loans that are not considered to be qualified mortgages, but because they will lose some protection should the borrower default on a mortgage loan, most other lenders might just stick to the new definition and stay within the guidelines. This may mean less flexibility in the marketplace for some buyers. Have a loan term of 30 years or less. Not have negative amortization (monthly payment must cover all the interest due). Not be an “interest only” loan. Not be a “balloon payment” loan where a large lump sum of the principal is due back at one time (exception made for small lenders). Upfront points and fees must not exceed 3 percent of the total loan amount. Note: This cap on points and fees may make lenders less likely to offer smaller loans (less than $100,000). 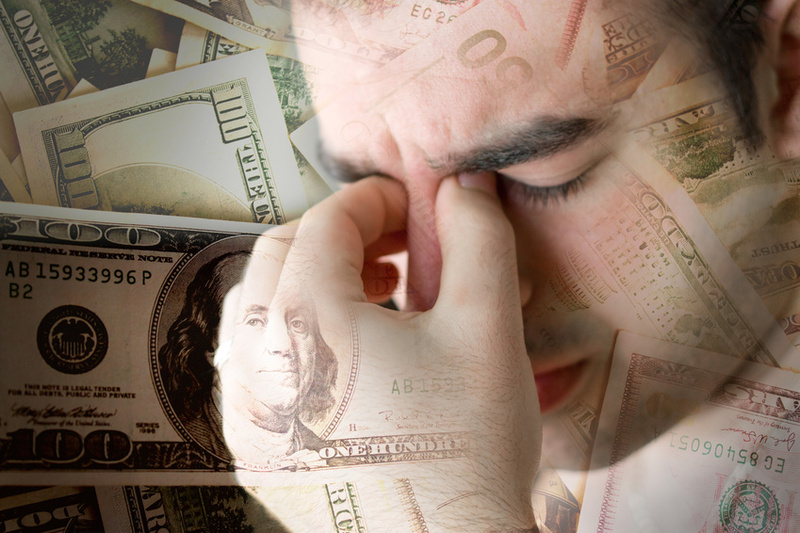 Debt-to-income ratio may not exceed 43 percent. *Note: This can be superseded if the loan is originated and kept in portfolio by a qualified small lender, or if the loan is approved by FHA, VA, USDA, RHS, Fannie Mae or Freddie Mac. But it may become harder for people with higher debt loads to get approved for a new home if they cannot stay below the 43 percent debt-to-income ratio. This last guideline is likely to affect many Buyers in Northern Virginia. If you’re wondering how much of a mortgage you can qualify for, contact our partner Paul Diaz at New Penn Financial. He can help you analyze the loan product that works best for your needs and help you get pre-approved for a mortgage. This gives you the power of a CASH buyer! 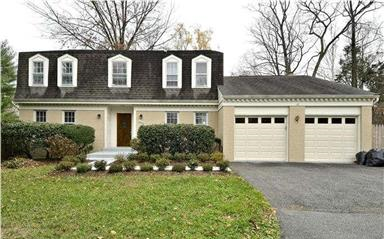 If you’re looking for a home in McLean, just 10 minutes to Washington DC – then stop by our open house on Sunday. You just might find the home of your dreams at 6423 Linway Terrace! 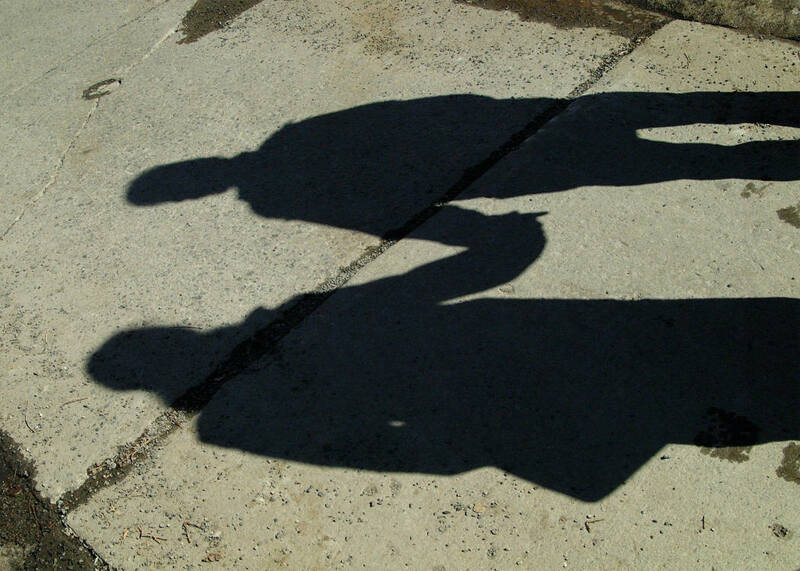 Have you ever heard the term “shadow inventory“? As you know, inventory around Northern Virginia is scarce. Homes are selling quickly and there is not a glut of homes on the market the way there was five years ago. Homes that are priced well, in a good location and in good condition are getting snapped up – and sometimes getting multiple, competing contracts and selling over list price. Places like Vienna, VA for example, only have 2.5 months of housing inventory. In the meantime, prices are rising and so are interest rates. So what is a Buyer to do? As an example, The Belt Team has signed listings for properties in the following areas that are not on the market yet: Great Falls, VA and Vienna, VA. If you would like to work with a real estate team who is creative, proactive and who thinks outside the box, contact The Belt Team at (703) 242-3975. That’s what it takes to make your real estate dreams come true in today’s market. Prices are steadily rising. 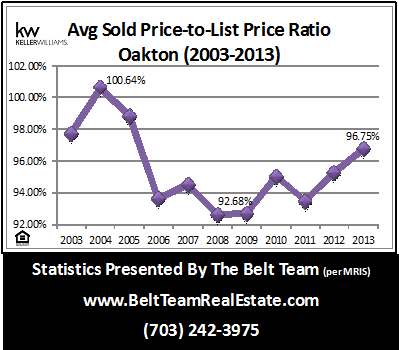 The average price in Oakton rose 9% over the previous year. However, unlike in Vienna where prices are higher than they were at the height of the market in 2006; Oakton’s prices remain below the market high in 2005. 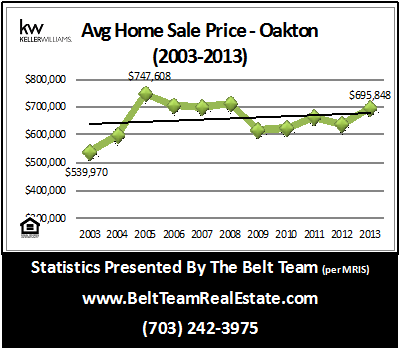 Oakton saw a HUGE jump in sales in 2013 – 35% over the previous year! More homes were sold than in any year since 2004. FREE – How Much Is My Oakton Home Worth? 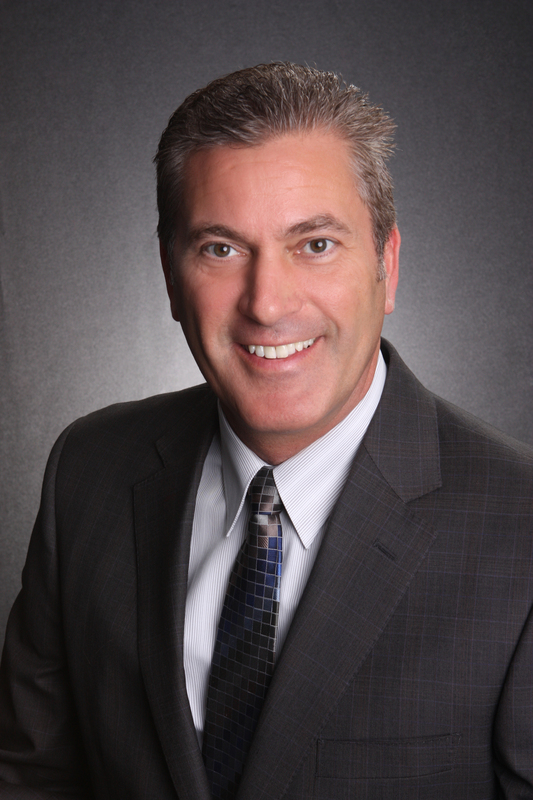 Contact our CEO, Terry Belt about selling your home in Oakton. Contact our Senior Buyer Specialist, Tom Reilly about buying a home in Oakton.